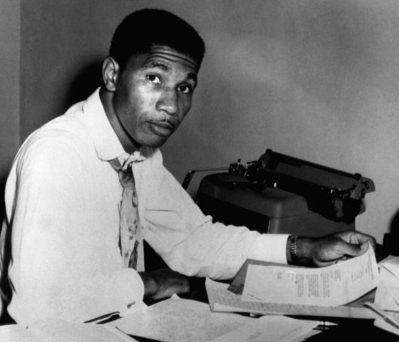 Medgar Evers had misgivings about SNCC–too young, too radical, not knowledgeable about the state. But on the other hand, he was frustrated. He was the NAACP field secretary for Mississippi, the first in the state, and his national office was reluctant to move on Mississippi–too dangerous, too little gained for the money likely to be spent. But SNCC, Evers concluded, as did other local NAACP leaders, represented young energy he could use. Evers laid much of the foundation on which the voting rights struggles of the 1960s were built. Before SNCC’s presence in Mississippi, he mentored young Mississippians who later became a crucial part of SNCC’s work. Students like Charles McLaurin, Dorie and Joyce Ladner, and Colia Liddell all looked to Evers for guidance before becoming field secretaries in SNCC. Evers’s relationship with SNCC was complicated at first. While he believed that the head-on confrontations that SNCC sometimes used in direct action protests might prompt violent responses against Black Mississippians, he also respected the militant actions they were taking to challenge inequality. Evers supported boycotts and sit-ins in Jackson and elsewhere as long as they were student-led. Despite his commitment to the NAACP, Evers and his wife Myrlie were apt to welcome activists from any organization into their state and into their home. Whatever differences he sometimes had with their tactics, he believed in their mission. In the early hours of June 12th, 1963, Evers pulled into his driveway, on his way home from a long rally at New Jerusalem Baptist Church. He was carrying a stack of NAACP t-shirts towards the house when a shot rang out from a nearby honeysuckle thicket. The bullet hit Evers in the back, just below his shoulder blade, and he died in route to the hospital. Michael Vinson Williams, Medgar Evers: Mississippi Martyr (Fayetteville: University of Arkansas Press, 2011). Interview with Ed King by Joseph Sinsheimer, February 23, 1987, Joseph A. Sinsheimer Papers, Duke University. Dorie Ladner, “The Activist,” American Experience PBS, June 23, 2014.